My kids have spent the last few weeks getting more and more excited about Easter so with my daughter having broken up from preschool for the holidays already it’s been the perfect excuse to do some Easter inspired painting. We’ve been buying little Easter eggs for an Easter egg hunt with the children’s cousins so with that in mind we made a little Easter egg hunting inspired painting. I’m also really excited to tell you about a Easter art competition where your kids creations could win some fantastic arty prizes! This Easter Ken Bromley Art Supplies are running a giveaway where you could win a hamper of kids art materials worth over £65! 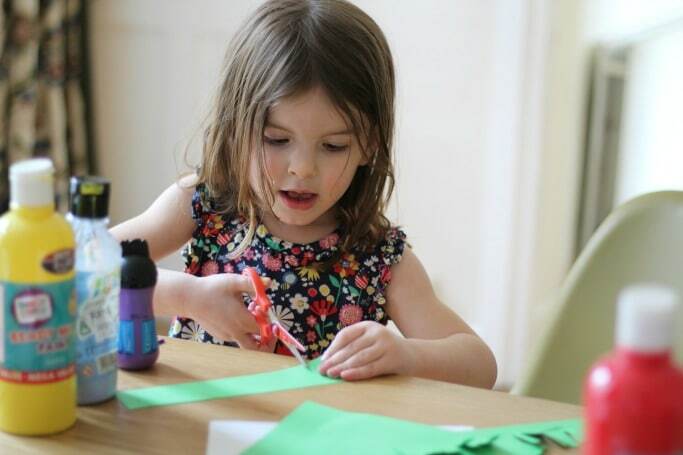 The prize includes paints, watercolour pencils, glue, felt tips and face paints amongst others – it really is a lovely prize for kids that love to get creative. To enter the competition all you need to do is send Ken Bromley Art Supplies a photo of your child’s Easter themed art work using the form on their website or share the picture on Instagram, Twitter, or their Facebook page using the hashtag #KidsPaintEaster. Deadline for submissions is Sunday 15th April and you can find out the full details of the competition including full terms and conditions and all the prize details of the Easter competition here. Need some inspiration? 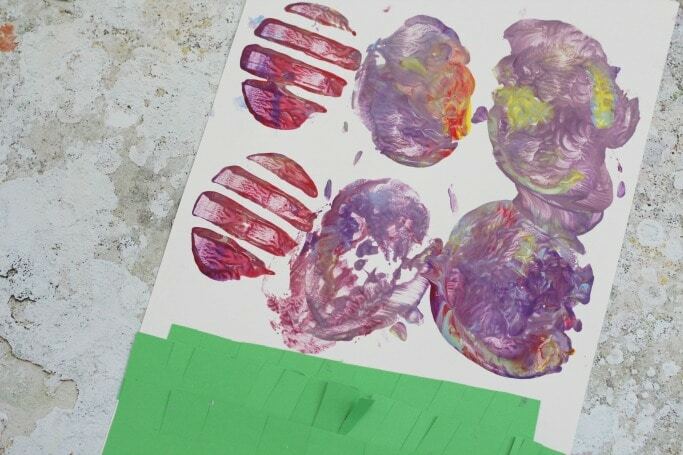 We’ve got 35 Easter activities for preschoolers that would be just perfect! 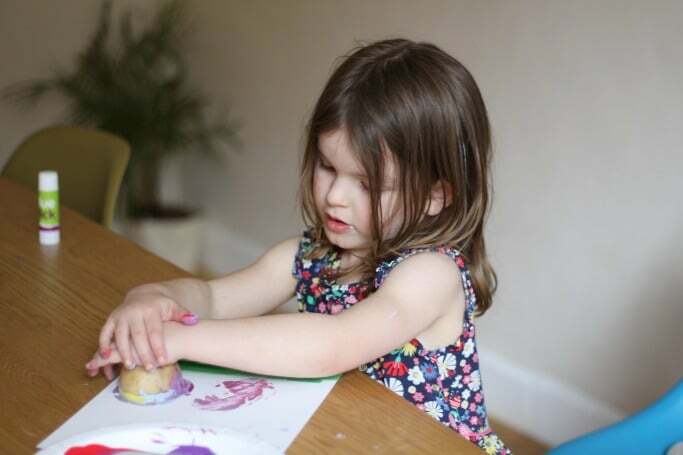 Of course it wouldn’t be right to share about Easter inspired painting without doing some painting with my own kids and my daughter was more than a willing assistant. For this activity you will need card, paint, potatoes, green card, scissors and glue as well as a sharp knife for cutting your potatoes. We started by cutting the potatoes in half (we used small baking potatoes as they seemed the most egg shaped) and leaving them to dry for a minute on a dish cloth, over the years I’ve noticed that potatoes tend to be quite wet when you first cut them so they don’t hold the paint quite so well – putting them onto a cloth for a minute helps to make them a bit dryer. My daughter decided that she also fancied some patterned eggs so using the knife I carefully cut a few stripes into a couple of the potatoes. Next up we made some ‘grass’ for our pictures, cutting out strips of green card and then cutting into it – this is a great way to practice scissor skills too (and not unlike our paper bag hair cutting activity) We then glued a few rows of grass to our card, playing with the grass means that you get a more three dimensional picture too as the bits of card move around. Next up is the printing – we did a mixture of putting the paint onto plates to stamp our potatoes onto and using a paintbrush to colour the stripes. Of course after the first attempt this turned into the normal ‘swirl all the paint around to see what colour it makes’ which is why my daughters has a bit of a marbled effect! 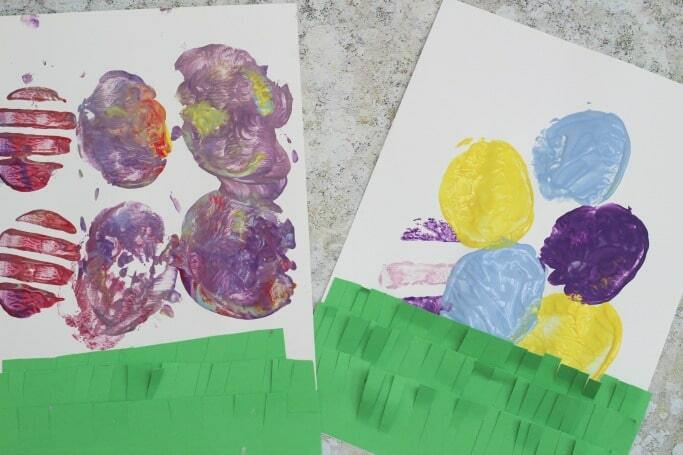 Stamp your eggs into your Easter egg hunt scene and your painting is done – this would be a great way to make some Easter cards too using some smaller potatoes. This was my daughters finished painting. We’re looking forward to joining in with the Easter art competition and I hope you are too – I can’t wait to see everyone’s entries! Ooooh thats a great idea! We still haven’t done potato printing, it needs to be done! I love potato painting! My mum used to cut letters into potatoes for me and my sister when we were kids so we could write messages ! That competition would be so great to win as the prize sounds fantastic and perfect to get your children into arts and crafts. My sister does a lot of activties like these with my neice. It’s so easy to make great patterns with potatoes isn’t it! The competition prize sounds fantastic. I used to love potato printing when I was little, I’m sure my pictures never looked as good though!